Episode 11: Spell Duelists – Fight! Welcome to our greatest episode yet! 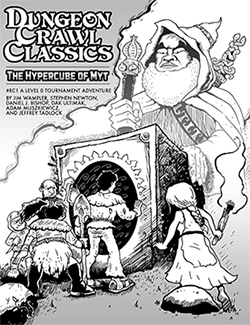 Tonight we’re going to take a look at one of the Dungeon Crawl Classics RPG’s defining game mechanics. When two wizards meet in a world where magic is wild, dangerous, and often barely understood by mere mortals, chaos quickly ensues. Two wizards go in, and only one wizard walks back out. Somebody’s going down. That’s right, with the help of very special guests Goodman Games writers Harley Stroh and Michael Curtis, we’re talking about the Spell Duel. Yessssss! Let’s get down to it Boppers! Good podcast again! Excellent smack talk! With my home group, the first Spell Duel we had was with the wizard in Doom of the Savage Kings (Harley gains initiative). Even though the wizard uses the “NPCs are different” rule, the excellent Crawl! Fanzine had me covered with its Magic Issue (Rev Dak jumps into the duel and rolls higher!). It was a lot of fun, even though I didn’t have a clear handle on all of the mechanics yet. Luck was actually used in that duel to create a phlogiston disturbance on purpose. However, the best Spell Duel set-up to date is at the end of Emirikol Was Framed, so the contest goes to Mr. Curtis. (The runner up is The Nazhghad’s Invocation by Paul Wolfe in In The Prison of the Squid Sorcerer). A fun mechanic, and one that should be used more often in my own games! Oh, and Frozen in Time is an EXCELLENT adventure! Very different from Sailors on the Starless Sea or The 13th Skull, and it shows how different authors bring different influences to the table. I highly recommend it. Do you have to pay to download this document? Great Episode! I love how it sounds, when Harley is laughing. the Spell Duel lived up to the billing (billing that took 3-4 podcasts, hah)! Harley was talking some sh!t! Great stuff. So, has anyone toyed with using Intelligence for Initiative for spellduels? What movie is the intro to this episode from? It’s from as awesome of an Appendix N animated movie as one could wish for: “Wizards” (1977), directed by Ralph Bakshi.